Classic cars for sale, classic cars canada, buy, trade, sell and browse our used classic cars, classic car clubs, vw for sale, karmann ghia for sale, porsche for sale, 356 porsche for sale, 911 porsche for sale, hot rod and muscle car photo classifieds. The web server used by Classiccars.ca is located in Montréal, Canada and is run by Netelligent Hosting Services. On this web server 89 other websites are hosted. The language of those websites is mostly english. 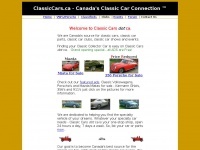 A Apache server hosts the websites of Classiccars.ca. The website does not specify details about the inclusion of its content in search engines. For this reason the content will be included by search engines.